Woodbine Development Corporation and IMG Academy broke ground on a 150-room upscale boutique hotel on the northern edge of IMG’s 500-plus-acre campus. 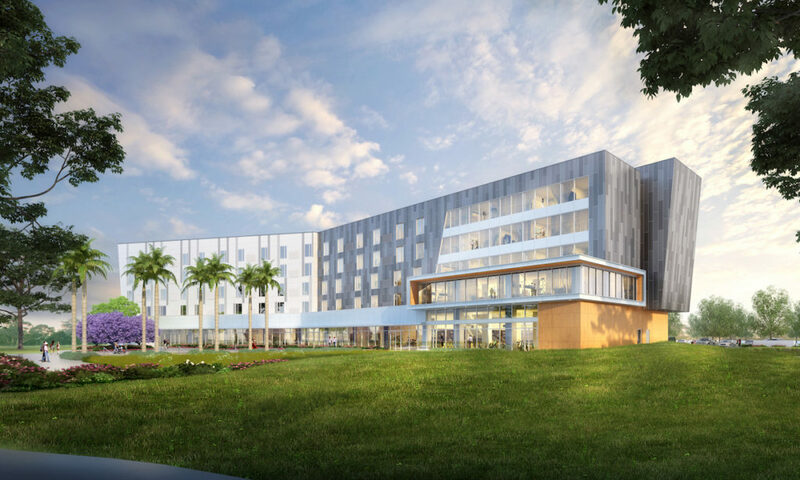 The five-story hotel—which will be known as The Legacy Hotel at IMG Academy—will serve guests and clients of the world-class training facility, including visiting teams, coaches, student-athletes, staff and parents. Additionally, it will provide a go-to destination for visitors to the surrounding community. The hotel is anticipated to open in the fall of 2018. Dallas-based Woodbine is developing the property for IMG. Tandem Construction is the general contractor, and other consulting partners for the project include: architecture by 5G Studio of Dallas; interior design firm Edge ID of Salt Lake City; and global landscape design firm SWA. Whitney Bank d.b.a. Hancock Bank is the lender. Renowned for its unparalleled training facilities and premier performance resources for students and athletes, IMG hosts clients and guests from around the world for boarding school, youth and adult camps, college and professional athlete training, team training and events. The Legacy Hotel at IMG Academy will bring comfortable upscale accommodations adjacent to campus—also offering a luxury getaway with prime access to Gulf Coast beaches, shopping and local attractions. The Legacy Hotel at IMG Academy’s architecture is complementary to the existing modern structures on campus, while exhibiting an individualized theme that draws inspiration from movement. It will showcase a mix of patterns, hues, varied reflectivity and geometrical elements that create a sense of motion. The hotel will give a nod to the dynamic and specific nature of athletic movement through the placement, orientation, specifications and shading of the building’s extensive glazing. The overall design will serve to optimize energy efficiency by maximizing interior lighting while minimizing direct solar heat. The interiors of the hotel will exhibit a sophisticated style that feels fresh and inviting for guests from around the world. Spaces will showcase rich materials, patterns and textures, among them: tile, quartz and wood finishes with metallic accents and pops of color throughout; striking vinyl wallcoverings and varied flooring surfaces; leather, wood and upholstered furnishings; and ambience-enhancing, design-driven artwork and lighting. In combination, all elements will create a place where visitors can feel at home while also enjoying the carefree feeling inherent in a hotel stay. 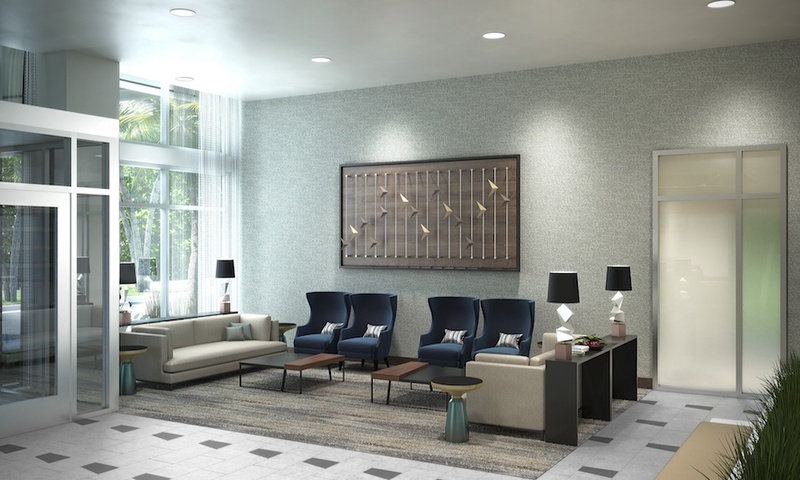 The amenity lineup at The Legacy Hotel at IMG Academy will feature an elevated lobby lounge and bar, a three-meal restaurant, as well as a massage and fitness facility. The hotel will also offer 5,060 square feet of flexible meeting space for seminars, specialized training and other functions. Alfresco amenities include a resort-style swimming pool, outdoor event areas and breakout spaces—ultimately creating a secluded and relaxing oasis within footsteps of the hotel building and the rest of campus. Woodbine Development Corporation is a full-service real estate company with more than 40 years of development, investment, acquisition and asset management experience. With offices in Dallas, Phoenix and Los Angeles, Woodbine specializes in hotels, resorts and mixed-use developments throughout the United States. The company’s hospitality portfolio features major brands, independent hotels, full-service destinations and select-service stays alike. Since 1973, Woodbine has been involved in more than $7 billion in commercial real estate projects, including the development, ownership, asset management, repositioning or renovation of over 17,000 hotel rooms. To learn more, visit www.woodbinedevelopment.com. IMG Academy is one of the world’s largest and most advanced multi-sport training and educational institutions. IMG Academy helps countless youth, adult, collegiate and professional athletes reach their full potential in and out of sport by providing world-class teaching and coaching, tailored programs and professional facilities. Based in Bradenton, Florida, IMG Academy also serves as a training and competition venue for amateur and professional teams, a host site for a variety of events, and a hub for sports performance research and innovation. To learn more, visit www.imgacademy.com.